Thank you to the artist and Google images. Strange how the streets are always dead this time past midnight. Ordained by the Gods of the dark so as to allow the single trench coat figure to go unnoticed. 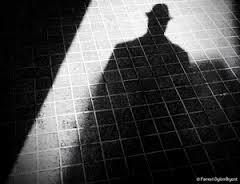 Steadying his Fedora, he slips from dimmed lamp light into the black world of nefarious doings. The soles of his well-worn John Lobb’s crunch on the aged granite stairs. He descends into the cities underbelly. Tonight, he feels his years. The leather work case containing his pernicious tools weighs him down. Well used joints ache from the dank cold. It is time to retire. He yearns for the warmth of the sun. His mind’s eye is distracted by its golden rays, as they bounce off the white sands of Santorini, warming a bottle of Ouzo on the table beside him. He is Irish by birth and tired of living in the bloodied shadows of Hades kingdom. No longer able to stomach the wails and pleas of those from who he is to extract knowledge. He raps his arthritic knuckles against a thick iron door and the small window slides open — two beady, brown eyes leer. Just as fast it shuts, followed by the familiar sound of a heavy deadbolt. Its rusted metal grates to one side. The massive block heaves – hinges groan. The square entrance opens and gives ingress to the sullen old man. With gnarled fingers, he removes his hat and makes ready for his final job at hand.